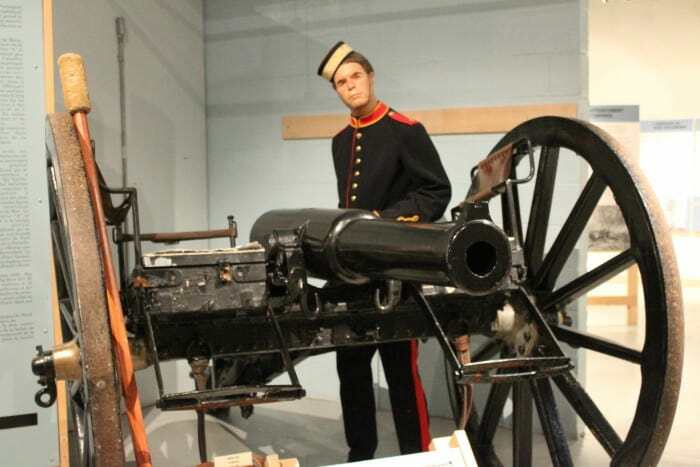 The 9 Pounder Rifled Muzzle Loading Gun (9 Pdr RML) was the first gun used in action by Canadian Gunners, being deployed during the North West Rebellion of 1885. It was in Canadian service 1873-1897, replacing the 9 Pdr SB. The gun still has no recoil mechanism and must be re-positioned after each shot. This gun is on loan from the RCMP. It was used by A Battery during the battles of Fish Creek and Batoche in 1885. It is also the gun used to carry the Canadian Unknown Soldier to his tomb at the National War Memorial during his funeral in Ottawa on 28 May 2000.